In some circumstances Pang is considered a Chinese surname but there were Caucasians with that surname. During the Civil War, it’s not clear how many people surnamed Pang were Chinese. Here is information about Charley Pang a confederate solider. page 64: Pang, Charley, Pvt. Co. G. 1st La. Inf. En. —. Federal Rolls of Prisoners of War, Captured near Chickamauga, Ga., Sept. 20. 1863. Forwd to Military Prison, Louisville, Ky., from Nashville. Tenn., Sept. 30, 1863. Transfd. to Camp Douglas, Chicago, Ill., Oct. 2, 1863. 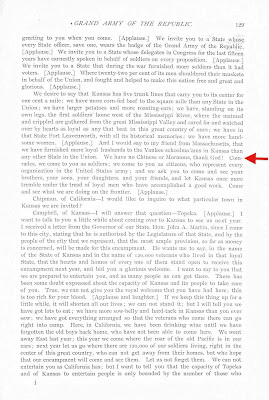 Pang’s entry was transcribed at Association to commemorate the Chinese serving in the American Civil War. Pang is in the National Park Service database. 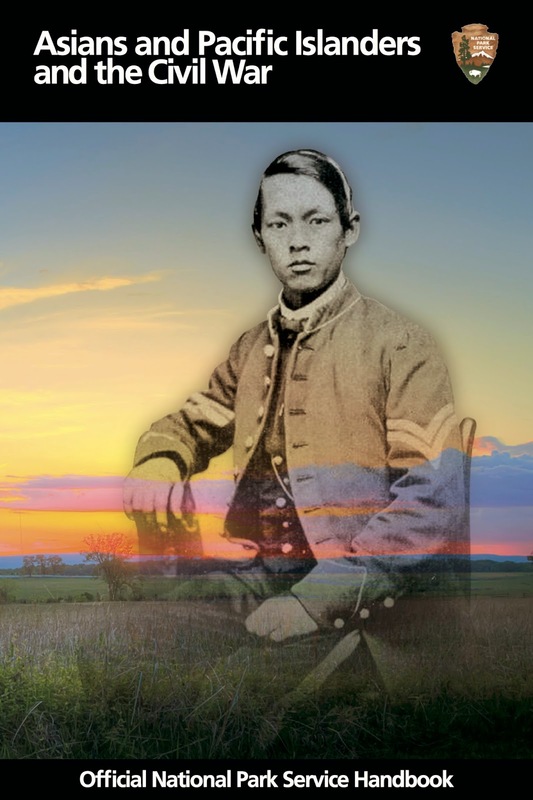 Pang has an entry in The Roster of Confederate Soldiers, 1861–1865: Oadneal, Alfred N. to Rand, William H. (1996). So far, no document or article identifying Charley Pang as Chinese has been found. 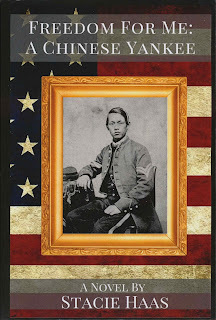 He was not the only Pang in the Louisiana infantry. There was Leon Pang. Here are two records at Ancestry.com. It’s not clear if Charley and Leon were related. They have not been found in the 1860 U.S. Federal Census. Here are the records of four more Pangs. There is no evidence of anyone surnamed Pang who was Chinese and served during the Civil War. 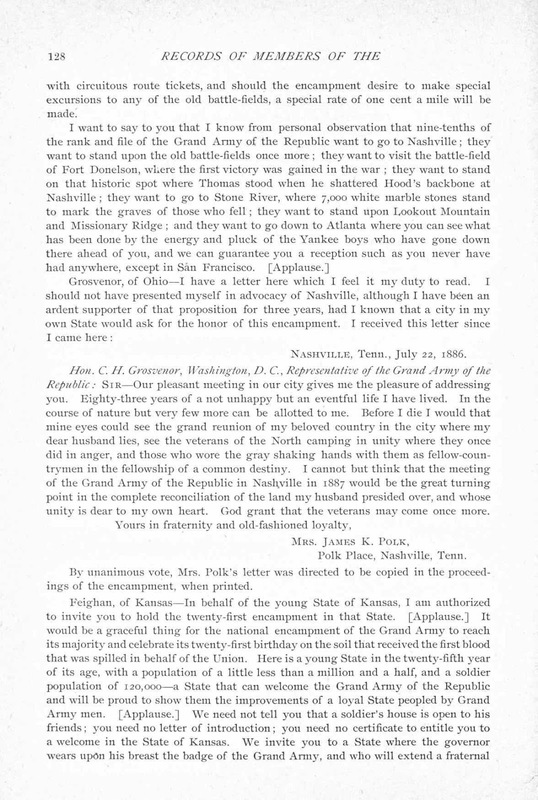 “We have no Chinese or Mormons, thank God!” was published in the book, Records of Members of the Grand Army of the Republic with a Complete Account of the Twentieth National Encampment (1886). For the full context, please see the bottom of page 128 and the top half of 129; the link to the book is here. 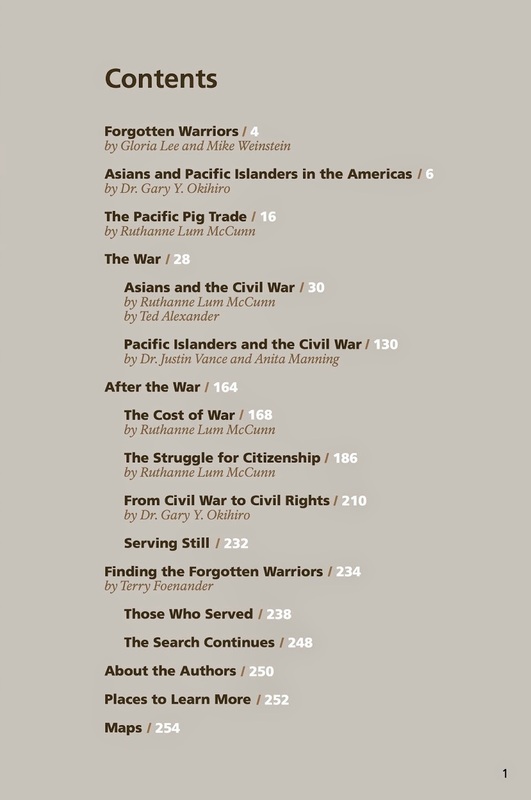 Asians and Pacific Islanders and the Civil War is available at Eastern Nationals’s eParks website and and Western National Parks Association’s website. The 259-page book was produced by the National Park Service. Carol A. Shively is the editor. The contributors are Dr. Gary Y. Okihiro, Ruthanne Lum McCunn, Ted Alexander, Dr. Justin Vance, Anita Manning, Terry Foenander, Gordon Kwok, Irving Moy, Jessica Garcia, Mike Weinstein, Laura A. Miller, Marla R. Miller, Richard Hoover, Steve Phan, Barry Crompton, Tom Brooks, Ed Milligan, and Alex Jay. 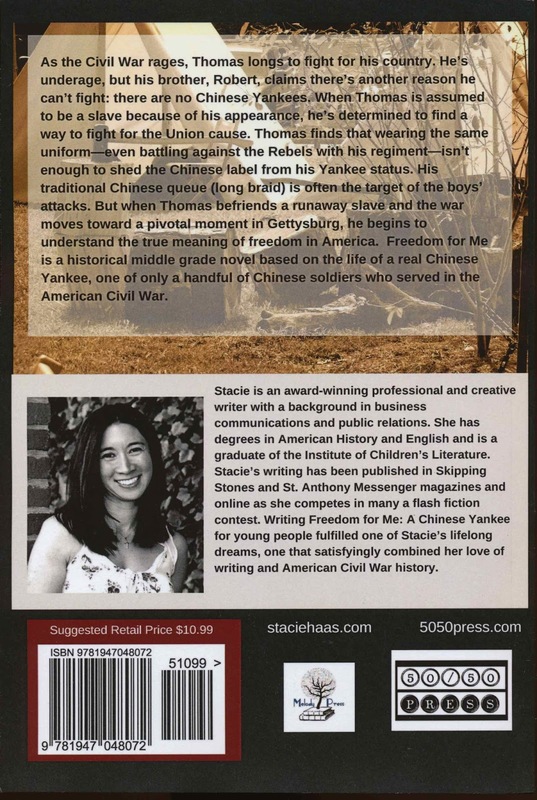 The following people of Chinese descent are profiled or mentioned in the book. The names are linked to my blog posts. 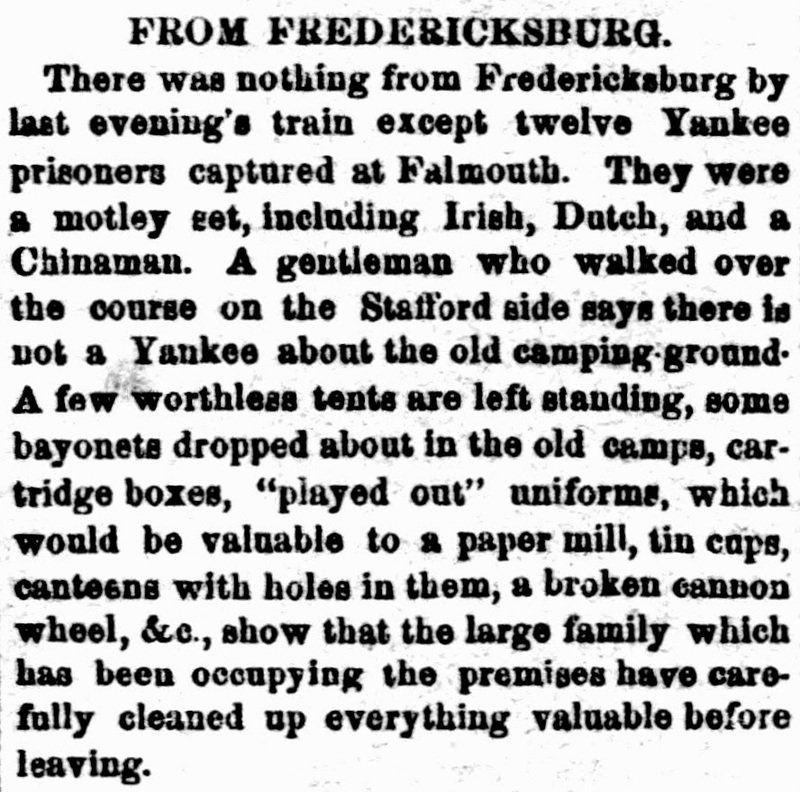 There was nothing from Fredericksburg by last evening’s train except twelve Yankee prisoners captured at Falmouth. They were a motley set, including Irish, Dutch, and a Chinaman. A gentleman who walked over the course on the Stafford aide says there is not a Yankee about the old camping ground. A few worthiest tents are left standing, some bayonets dropped about in the old camps, cartridge boxes, “played out” uniforms, which would be valuable to a paper mill, tin cups, canteens with holes in them, a broken cannon wheel, &c., show that the large family which has been occupying the premises have carefully cleaned up everything valuable before leaving. The Chinese Union soldier POW was John Tomney. Tomney is in the National Park Service book, Asians and Pacific Islanders and the Civil War. The Notorious Chinaman, Quimbo Appo, Arraigned in the Tombs for a Villainous Assault. Charles Poun appeared in the Tombs Police Court yesterday, before Justice Dowling, with a very bad black eye, cause by a blow of a hammer in the hands of the notorious Quimbo Appo, who about eleven years ago was tried and convicted of the murder of a woman and sentenced to be hung, but whose sentence was afterwards commuted to imprisonment for life. Appo has now had his liberty for about eighteen months, most of which time he has spent on the Island, Justice Dowling ridding the community of this dangerous character every time he was brought before him. Poun and Appo are both Chinamen, but the former is quite a respectable and industrious man, with whom Appo has been recently boarding. 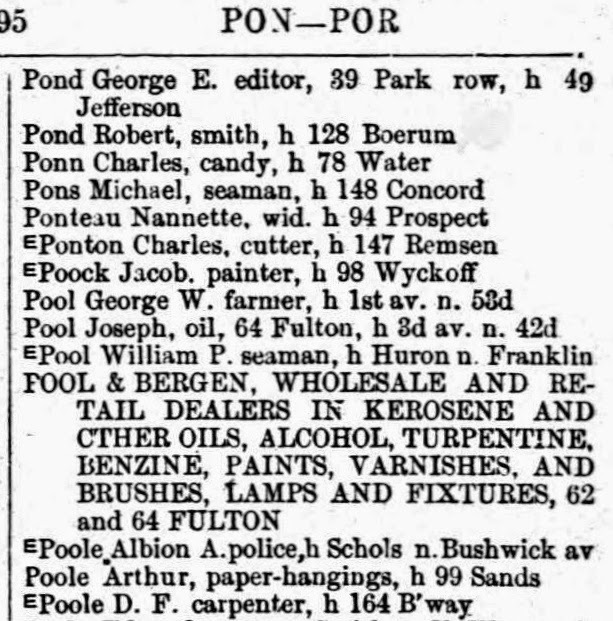 Appo has not only been living free of expense at Poun’s house, but he has compelled that individual to supply him with considerable quantities of candy, by the manufacture and sale of which Poun ekes out a living, and it was on account of Poun’s refusal to continue this generous treatment of the convict that the latter brought brute force to bear in an attempt to compel him. Poun, in making his complaint yesterday, replied to the questions Mr. Finlay, Justice Dowling’s clerk, that he was a Christian Chinaman, who was able to read and write in his own language and in English, having by perseverance taught himself without the aid of an instructor. Justice Dowling committed Appo for trial. 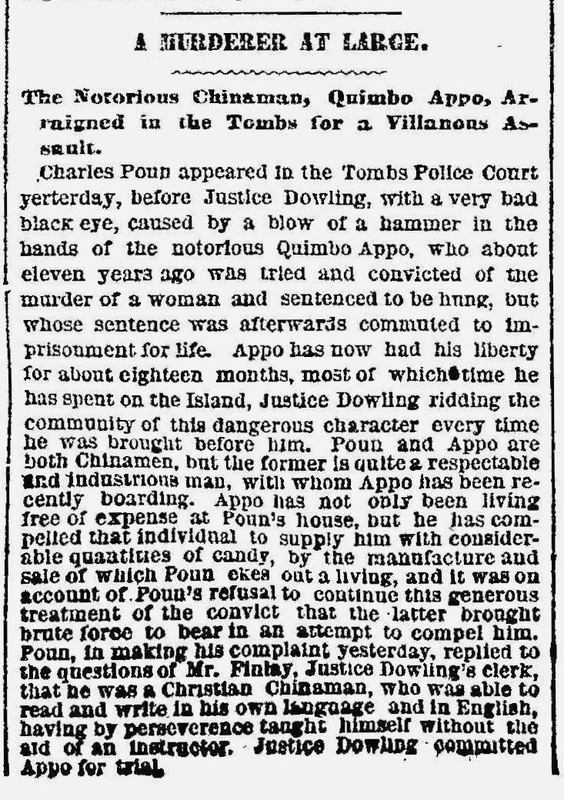 Quimbo Appo, who was tried and sentenced to death in 1859 for the murder of Mrs. Fletcher, but whose sentence was commuted to confinement in State Prison for ten years, was arraigned at the Court of Special Sessions yesterday, charged with having assaulted a fellow Chinaman named Charles Poun. The prisoner struck Poun with a hammer, inflicting a severe wound. Judge Dowling, in sentencing Appo, reviewed his past record, and remarked that he regarded him as one of the most dangerous characters in the city, and sentenced him to pay a fine of $50 and to serve six months in the Penitentiary. He Was a Veteran of the War and the Matrimonial Field. Two Wives Precede Him, While a Third Is Left Behind to Spend His Dollars. Who says that the Chinese are not progressive? Chon Ah Pon came to America from his home in the Flowery Kingdom when he was six years old and before the war. He started a small confectionery store on Main street, Brooklyn. Like all of his countrymen, Chon had a winning way which captured the smiles of the candy loving maids and the dollars at the same time, and so Chon prospered in the land of his adoption and grew rich. But Chon was lonely in his little confectionery store and longed for some one to help him and keep him company. Of the many who came to purchase of the Chinaman’s sweets none pleased him more than a fair and buxom young Irish maid, and, after the usual consideration which all Chinamen give to any subject Chon proposed, was accepted and married. It may have been on account of the many confections in his little store, or may be it was his dollars; but at all events Chon and his wife had a happy time and the coin continued to accumulate rapidly. Chon was perfectly happy until one day his young wife died suddenly, and Chon for a time was disconsolate, but soon became enamored of another of his customers, also an Irish girl and asked her to marry him. She agreed provided he would join the Catholic Church and change his name to Charley Marry. This he agreed to do, and the marriage took place. Soon after the happy event the Civil War broke out, and Charley, like any good American Christian, shouldered his gun, joined a New York regiment and started for the front. He did good service through the war, and at its close returned to Brooklyn and again opened his business. But alas, for poor Mr. Marry! One day his second wife went the way of all flesh and he was again disconsolate. But, as on the first occasion, it only lasted a short time, for Charley gave up his business where be had made a fortune and came to New York to live. He was a member of all the Chinese societies in town and a good fellow generally. His charms succeeded in winning for him a third wife, also a daughter of the Emerald Isle, and his cup of happiness was again full. But it did not last long. The husband of three wives, the Americanized Chinee, had to go. A short time since he made a trip to San Francisco, and when he returned he was in ill health, Mrs. Marry did all she could for him, but last Sunday, at the age of sixty-one, Charley Marry, or Chon Ah Pon, went to join his fathers, leaving a Mrs. Marry behind to mourn his loss and console herself with the thought that she was the possessor of a big pile of dollars, and there were no children to claim a cent from her. 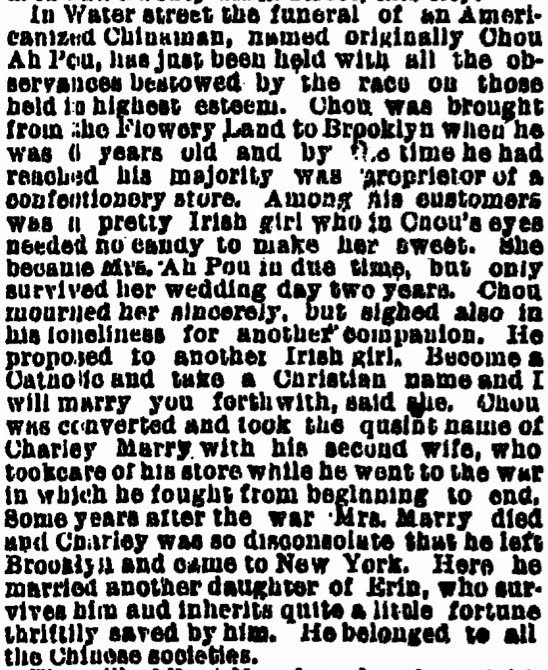 According to the Times Chon died poor and was buried at Evergreens Cemetery. Chon Ah Pon, one of the oldest Celestials in New York, died on Sunday night and was buried yesterday according to the rites of the Roman Catholic church. The dead Chinaman was 61 years old and had lived in this country 25 years. He fought in several battles during the war of the rebellion. He was married three times, each time to an Irish girl, and leaves the last a considerable fortune. He was a member of all the secret Chinese societies in the city. The Funeral of an Americanized Chinaman Who Served in the War. There was a notable gathering of Chinamen yesterday at No. 383 Water street to attend the funeral of Chon Ah Pon, who served in the War of the Rebellion. Chon came to the City of Churches when a boy of six. He became converted, married the fair girl and called himself Charley Marry, The war, meanwhile, had broken out, and Marry shouldered his musket and fought during the “unpleasantness” like a good American Christian. At its conclusion he reopened his candy store in Brooklyn and perfect happiness seemed to be his. One day his second wife died and he was again broken hearted. He left Brooklyn, and in this city married another daughter of the Emerald Isle. She survives him, and owns a considerable fortune, which he bequeathed her. On account of his being a member of all Chinese societies and generally respected his funeral was largely attended. He Fought for His Adopted Country and Left a Big Fortune to His Third Wife. Chon Ah Pon, one of the oldest Celestials in this city, died on Sunday night at his residence, 383 Water street, and was buried from there to-day according to the rites of the Catholic Church, of which he was a member. He was sixty-one years old. He came to this country from China when he was thirty-six years old, and started in the confectionery business on Main street, Brooklyn. He made money and married an Irish girl. They lived happily until she died. He did not long remain a widower, but took another Irish girl for his bride. She induced him to join a Catholic church in Brooklyn. He was baptized and adopted the name of Charles Maney [sic]. His second wife died about eleven years ago. When the war broke out Chon went to the front, and fought bravely until the close of the war for his adopted country. After the war he started in business in Brooklyn again, and made a fortune, upon which he retired about seven years ago. He made a trip to San Francisco, after which he returned to this city, where be lived until he died. About six months ago he married for the third time. A comely daughter of the Emerald Isle was his bride, as usual. He leaves her quite a large fortune. 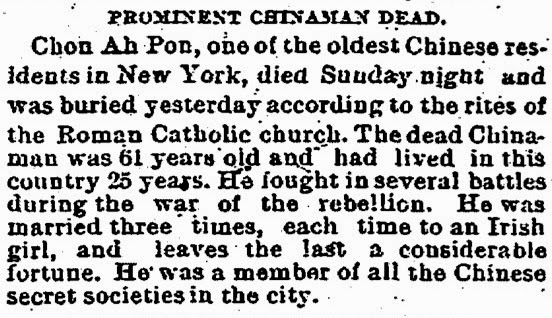 He was a member of all the secret Chinese societies in New York. He had no children by any of his wives. 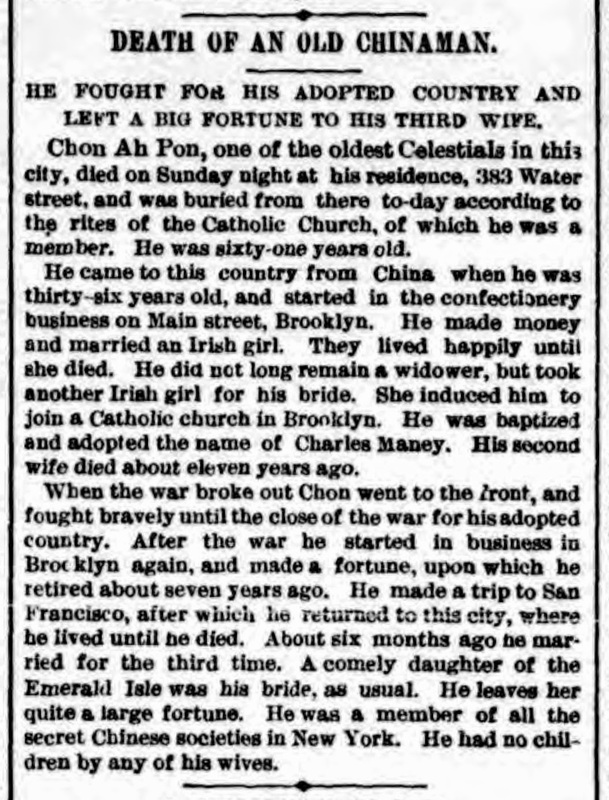 Chon Ah Pon, a Chinaman who served in the war of the rebellion, and had married three wives in due succession, all Irish girls, died and was given a stylish funeral in Brooklyn the other day. He kept a candy store, and his American name was Charles Marry. In Water street the funeral of an Americanized Chinaman, named originally Chou Ah Pou [sic], has just been held with all the observances bestowed by the race on those held in highest esteem. Chou was brought from the Flowery Land to Brooklyn when he was 6 years old and by the time he had reached his majority was proprietor of a confectionery store. 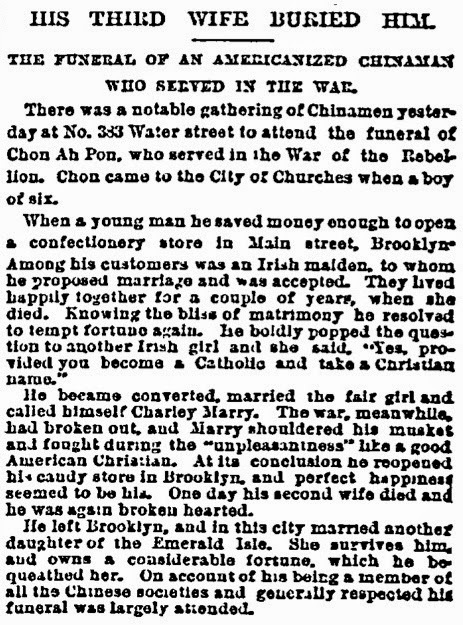 Among his customers was a pretty Irish girl who in Chou’s eyes needed no candy to make her sweet. She became Mrs. Ah Pou in due time, but only survived her wedding day two years. Chou mourned her sincerely, but sighed also in his loneliness for another companion. he proposed to another Irish girl. Become a Catholic and take a Christian name and O will marry you forthwith, said she. Chou was converted and took the quaint name of Charley Marry with his second wife, who took care of his store while he went to the war in which he fought from beginning to end. Some years after the war Mrs. Marry died and Charley was so disconsolate that he left Brooklyn and came to New York. Here he married another daughter of Erin, who survives him and inherits quite a little fortune thriftily saved by him. He belonged to all the Chinese societies. Chon Ah Pon is in the National Park Service book, Asians and Pacific Islanders and the Civil War. ...and at the time our informant visited them—Chang and Eng were residing there, while Sarah, Eng’s wife, and her children were at the Trap-Hill establishment. As in point of time, the first call was upon her—she, at first, is here entitled to notice. S.D. Bunker was not in his father’s household and has not yet been found in the census. 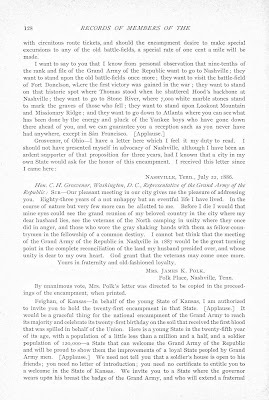 Page 63 photograph of a Confederate reunion in Mount Airy probably included the Bunker brothers, Christopher and Stephen. 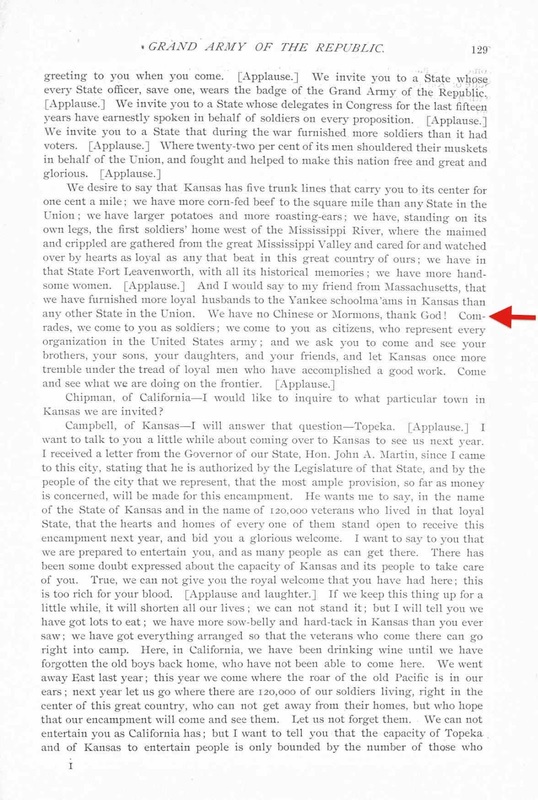 Bunker is in the National Park Service book, Asians and Pacific Islanders and the Civil War.